Luxury watch brand GRIEB & BENZINGER has developed and utilized the color blue in their blue platinum watch coating. They just announced the introduction of their new luxury watch line – Blue Chips. The new Blue Chips fine watch collection from GRIEB & BENZINGER, who is widely known as masters of skeletonization, is a thing of elegance and beauty. * Blue Polaris Midnight Imperial – available in 18K white gold with a black Princess-cut diamond-set bezel. Below is a summary description of each of the four Blue Chips luxury watches from GRIEB & BENZINGER. This watch model’s movement has been skeletonized, guilloché, and engraved fully by hand. It comes in a floral pattern and coated with blue platinum. Features a solid 18K red gold case, 43 mm in diameter, hand-guilloché bezel, blue alligator skin strap with an 18K gold buckle. This watch model’s movement has also been skeletonized, guilloché, and engraved fully by hand. It too comes in floral pattern and coated with blue platinum. Features a solid 18K white gold case, 43 mm in diameter, bezel and lugs set with 77 of the finest brilliant-cut diamonds (2.55 ct), blue alligator- skin strap with an 18K white gold buckle. This watch model comes with a two-part dial, hand-guilloché base dial, manually wound movement, skeletonized, guilloché and is engraved by hand. The watch includes a solid PT950 platinum or 18K rose gold case, 43 mm in diameter, hand-guilloché bezel, dark blue alligator skin strap with a PT950 platinum or 18K rose gold buckle. This watch model is available with a two-part dial, hand-guilloché base dial, manually wound movement, skeletonized, guilloché and is also engraved by hand. It features a solid 18K white gold case, 43 mm in diameter, bezel set with 66 fine black Princess-cut diamonds. Black alligator-skin strap with blue stitching and an 18K white gold buckle. I personally love the The Blue Polaris watch model. GRIEB & BENZINGER has designed an impressive looking luxury watch that features a well-made, guilloché blue base dial. The dial complements with the different shades of blue as light hits the guilloché pattern. The fully hand-guilloché and manual wound movement that displays the definite off-center hour and minute indication can be seen beneath the watch’s skeletonized dial. High-end luxury watches are not cheap, so it should not come as a surprise the new “Blue Chips” luxury watch collection from GRIEB & BENZINGER isn’t either. This Blue Chip watch collection consists of rare timepieces. Prices begin at around €40,500 for the Blue Tulip in rose gold watch model. The Blue Polaris Midnight Imperial model price can go up to about €85,000. 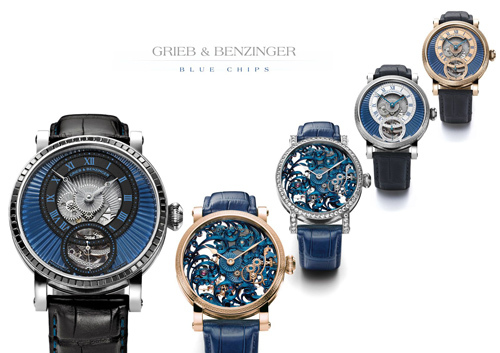 For luxury watch lovers, the GRIEB & BENZINGER “Blue Chips” watch collection deserves some serious consideration. If you are looking for a luxury watch, allow The Life of Luxury to help you procure a great watch at a great price. Come back often and follow this luxury blog to keep up on the latest product news in hte luxury watch industry.